Privately owned manufacturer of Metpump Brand Colloidal Silica bonded monolithic refractory available for a variety of manufacturing applications. In 1981, Magneco/Metrel was formed by a merger of two small companies, Magneco who made fired shapes and Metrel who made monolithic refractories. The concentration was to be on innovation and the creation of value to the customer by lowering the cost of his production. Early product combinations of Magneco/Metrel were refractory stool inserts with Metrel mortars, coatings and patch materials; Magneco dams, weirs and baffles combined with Metrel low cement castables and tundish veneers. Blast furnace cast house refractories which evolved from: fast drying shovel set and rammable materials using colloidal silica as a binder; to resin bonded ramming mixes and shapes made from low cement castables licensed from Kawasaki’s Refractories, starting in 1983. Starting in 1989 Magneco/Metrel, recognizing the insurmountable shortcomings of low cement castables, made a total commitment to a new technology utilizing the latest versions of colloidal silica combined with other chemical additives to form a unique binding system. Nanotechnology had come to the Cast House. The first products utilizing the unique colloidal silica binding system were pumpables, which could, of course, be cast but could also be moved through hoses at a considerable distance.The second round of complimentary colloidal silica bonded products was capable of being shotcreted to rebuild surfaces without the use of forms. Protection of new staves on their hot faces. 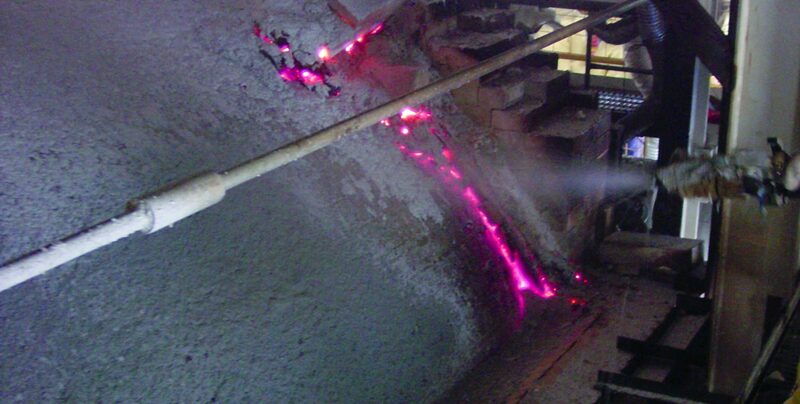 The unique characteristics of the refractories made with the colloidal silica binder system developed by Magneco/Metrel, caused Magneco/Metrel to experiment with a number of other formulas to create value for customers by providing quick repairs and therefore equipment availability. To date, there has been great success with Metpump ® brand monolithic materials in Reheat Furnaces, Glass Furnaces, Frit Furnaces, Sodium Silicate Furnaces and in the Aluminum, Copper and Ferro Alloys Industries. Products using the binder system are also finding success in Power Plants and throughout Industries in general, wherever heat and corrosive elements must be contained by material which can be endlessly repaired, providing fast turnarounds coupled with outstanding physical properties such as hot modulus of rupture, thermal shock and thermal cycling resistance and resistance to corrosive attacks.